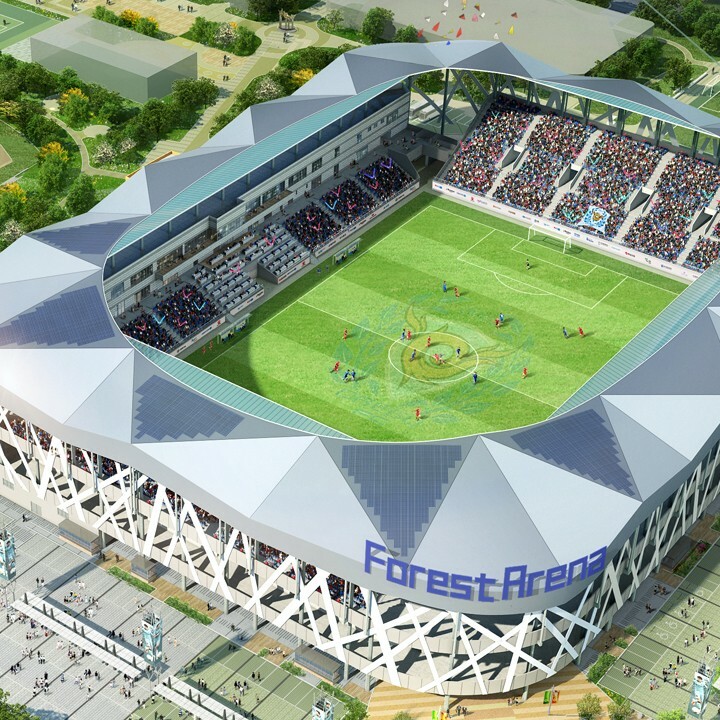 Decision to demolish the old Daegu Citizen Stadium was made in 2015, with a new football-specific venue to replace it. With more robust seating layout and complete cover of all spectators, the new stadium was commissioned with 12,000 seats instead of old ones almost 20,000. The entire complex spanning across 116,000 m2 was created in 1948 and is the most central leisure precinct in Daegu, having hosted games of the 1988 Olympics, among other events. In the 2015 design competition Mooyoung A&E and Hudigm A&E came victorious, even though their final design looks nothing like the initial one did. Even the scale changed to some extent with emphasis put on getting fans as close to the field as possible, leaving just 7 meters between players and spectators. 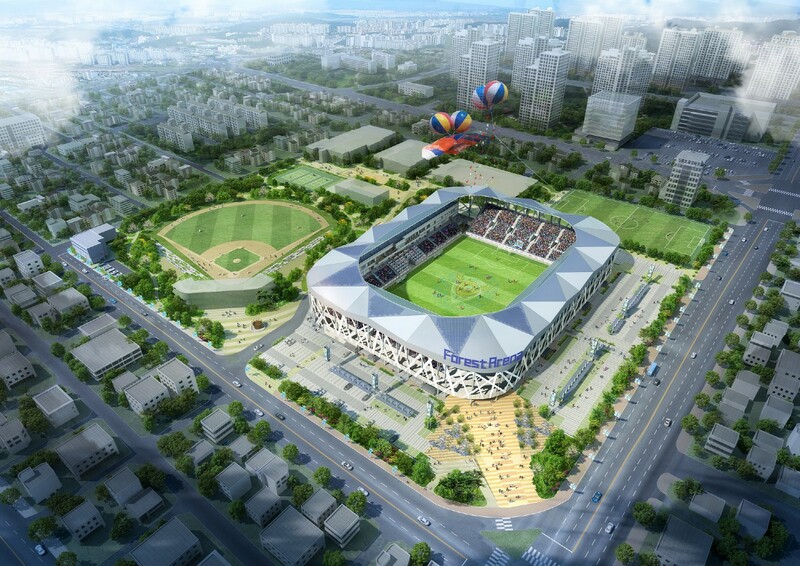 Eventual stadium design is expected to mimic key landscape features of Daegu. 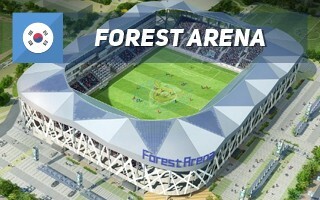 First, it's the city of forests, thus the interim name of Forest Arena. Diagonal supports (instead of a more opaque facade) represent the trees, while angular roof atop is said to copy mountains around. In order to make the stadium green in energy-efficiency meaning, photovoltaic panels will be installed on top od the south end. The single-tier auditorium will be uniform, though the west side is detached from remaining three stands. Here the seating is replaced by indoor facilities, ranging from FIFA-compliant sporting facilities, through corporate hospitality and restaurant, ending with a dormitory. 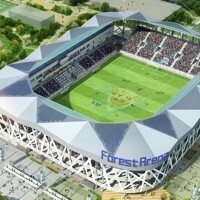 Daegu FC offices are also planned to be hosted here. Altogether the stadium will offer over 25,000 m2 of floor space. Demolition of the old stadium began between 2016 and 2017, followed by actual construction of the successor in June, 2017. The entirety, which will also include upgrades of remaining sport functions (mostly baseball stadium and ice rink) is expected to be done by the end of 2018, with funding estimated to reach 69.6 billion won.